President Nana Addo-Dankwah Akufo-Addo will visit the Upper West Region,on a two-day tour from 23rd – 25th July, 2018. The president is expected to commission the new Upper West Regional House of Chiefs building; commission the new library/Amatrol laboratory complex of the Wa Polytechnic; inspect ongoing works of a multi-purpose Youth Development Centre in Wa which is under construction; inspect ongoing works on the Wa-Han road; and commission other projects at the Ullo Senior High School in Jirapa. I learn with great shock and sadness, the decision of this group (Agenda 2020 for Alan-Kyeremateng and Paul Afoko) to threaten the president to terminate the appointment of the Wa MCE during his visit of the region to perform government business. The accusation against Hon. Alhaji Issahaku Tahiru Moomin (MCE) is trumped up;it is part of a well thought out plan by the group (Agenda 2020 for Alan-Kyeremateng and Paul Afoko) to rig the 2020 parliamentary elections in favour of the incumbent member of Parliament, Hon. Rashid Pelpuo in the Wa central constituency as they did during the 2016 elections. I dare the so called group to immediately give us reasons for which they think the MCE should be removed from office. The attempt and the fear for which reason they have set out to remove an arbiter of our elections so that they can rig the 2020 elections in Wa central in favour of the NDC parliamentary candidate. I further challenge the leader of the group embarking on needless removal of die hard NPP members from the constituency album, and manipulating it with NDC members during the constituency elections in the Wa central to favour his interest. 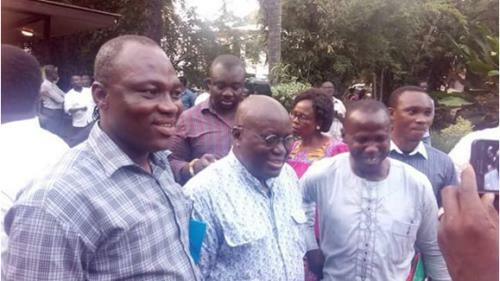 This same NPP group, on the 23rd of August 2016, repeated its call for then flag bearer of the party, H. E. Nana Addo Dankwa Akufo-Addo, now the president of Ghana to step down from his position to save the party from another humiliating defeat in the 2016 general election. What they have done over the years is to destroy our party; but I will not allow them to extend their destruction to the party this time around. This is a party that I will religiously guide and protect. They are planning to rally their supporters (NDC members) to disgrace the president during his visit of the Upper West region. The NPP group and their followers (mostly NDC members) will be hitting the streets of Wa Central with placards during the President visit“to show their anger” and also to remove the MCE from office so that the can get the opportunity to make this government unpopular. The group who threaten this demonstration are suffering from mental challenges and must be examined and treated before it’s too late. In fact, with the good works currently been executed by the President and his Municipal Chief Executives, anybody who demonstrates against them is a mad man. The people who threaten to demonstrate against the President and MCE also claim that the Akufo-Addo-Bawumia government is deliberately targeting the current minister for trade and industry, Hon. Alan John KwadwoKyeremateng for prosecution, that’s why the president appointed him into his administration. They claim his appointment is also a ploy by the president to prevent Hon. Kyeremanteng from contesting him (President Nana Addo) for the NPP flagbearership next year in a closed meeting yesterday. Even these same people never supported President Akuffo Addo to become the first gentleman of the land from 2008 up-to-date. “Mr. Group leader, leave Hon. IssahakuTahiruMoomin alone”. “Mr. Group leader Stop the lawlessness by your vigilantes”, “Mr. Group leader Stop the witch-hunting” Mr. Group leader try to stop your NDC people from the inscriptions on the placards. “You cannot tell the President to remove the MCE ……Why will the President Akufo-Addo remove the MCE, for what? Good will always triumph over evil. Hon. IssahakuTahiru Moomin is focused on delivering on the mandate given him by H. E. Nana Addo Danquah Akufo-Addo and will not waste his precious time on such wasteful adventures. I pray God will give us all long lives so that you can leave to see the transformation the MCE is bringing to Wa. July 21, 2018 in Business.